Why do puppies eat feces? 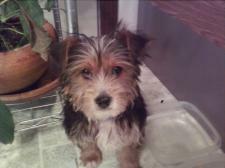 I have a 4 month old Yorkie. He is working very hard on his manners and house breaking. However, when we go for a walk I have noticed him trying to eat poop from other dogs. I find this highly disgusting and can't figure out why he would do this. My dog used to do this so I can definitely emphasize with you. Even though we dog owners find this behavior really distasteful, eating feces - either their own or those of other animals - is quite common among puppies and older dogs. But, because a pet can contract diseases and worms from doing this, it is important to break the poop sniffing or eating habit. The official vet term for this awful behavior is called Coprophagia and it can be caused by a couple of things. One is nutritionally based such as some vitamin or mineral could be missing from your pet's regular food and eating feces is his attempt at filling this void. If this is the case, simply adding a pet supplement to the diet may easily solve the problem. Puppies need well-balanced and very nutritious food especially during this major growth period of their lives. Another dietary cause could be that your dog is not digesting his food properly and therefore is not getting the full food value. Giving him a digestive enzyme could help in this case, or just try adding an enzyme-containing food to his usual meal, such as a small amount of unsweetened pumpkin, or a little pineapple. On the other hand, the problem could just be one of a learned behavior. Puppies initially see their mother eating feces to keep their den clean. Puppies may also see other dogs doing the same thing when they are out and about. Bearing in mind the curiosity that they have at this age, a puppy may just be experimenting when they try it for themselves! Sniffing at stools is also a way dogs learn about each other. You may be surprised to know that dogs can tell just by smelling the feces of another dog whether that dog was male or female, and in the case of a female, whether that dog was in heat! Whatever the cause of this objectionable behavior, most dog owners would agree that it is a problem worth solving. So here are a couple of suggestions of how to break the habit. First of all you can try making the poop pile undesirable by spraying it with citronella - a smell that dogs do not like at all. Menthol has a similar effect. Either one of these may do the trick and Citronella is readily available as it is used to cure excessive dog barking problems. Another strategy to use when you are out on a walk and see a "landmine" in the distance, is to either distract your dog away from it or take a detour. I used to do this all the time as a way to break my dog's habit. Of course, on occasion, they will discover a pile you hadn't noticed. When this happens use the "leave it" command as you lead them away from the poop. It may take a little repetition, but ultimately enforcing this training should solve the problem. I hope these suggestions will take care of correcting your pup's behavior.